Swords & Wizardry is a so-called "retro-clone", a rewriting and reorganisation of D&D from its earliest incarnations in 1974. There are others available (Labyrinth Lord for one, or BFRPG) but this is my favourite of the ones I've seen so far. It's a very rules-light, free-form system, simple and easy to learn and play, and lacking the byzantine complication and restrictions introduced in successive editions of the game. I've become quite interested in these retro-clones lately. They seem to have the potential to make roleplaying a lot more fun and a lot less work than has become the case with the gigantic, encyclopædic rulesets that have become fashionable in recent years. Here is some of the stuff I've done for S&W so far. I just have to tinker with game systems, I don't seem to be able to help myself. It's a sickness. Here is my heavily-houseruled interpretation of the Swords & Wizardry rules in HTML format (link opens in a new window/tab). I've incorporated my conflation of the Cleric and Magic-User into the Fighter-Mage, and pulled all the spells together into 20 spell levels. There are a few other, more minor, changes as well. I've formatted them for CSS2-3 with fixed positioning for navigation and multi-column layouts for spell and monster lists, so they'll probably look terrible in IE6. If you're still using that awful, awful browser... well, that's too bad. They work fine in Firefox, IE7, and Opera. These are the original Swords & Wizardry Core Rules in html format (link opens in a new tab/window). The die-type rolled for surprise will depend on character class, species, and possibly level. The default die remains the d6, with surprise usually occurring if a 1 or 2 is thrown. Naturally alert critters like elves, barbarians, rangers, watch-dogs etc. are only surprised if they roll a 1 (16.6%). Very alert critters like ettins, mid-level barbarians or rangers etc. get to roll a d8 for surprise instead of a d6, still requiring a 1 to be surprised (12.5%). And so on, up to a d30 (if you own one of those things, which I don't now do). The die-type rolled for initiative depends on the character or creature's DEX score, as shown in the table below. Archers may fire two arrows per Round only if they do not move. Crossbows can not, in general, be reloaded on the run. Only very light crossbows can be spanned with one hand. Anyone, with access to a set of lock-picks and a little bit of training1, can attempt to pick a lock. An attempt takes one Turn (ten minutes) and succeeds if a 1 is rolled on 1d6. If you buy a set of lock-picks as part of your starting equipment, it can be assumed that you've had that basic training as part of your character's background. If not, (i.e. after character creation) you'd have to seek out such training in-game. If a 6 is rolled, the lock is unopenable — the pick breaks off in it, the mechanism is jammed, or something else similar occurs — and will require attention from somebody with real skill (i.e. a Thief or a locksmith) to clear it before another attempt can be made. A Thief takes a Round (one minute) per attempt, not a Turn. A Thief succeeds on a 1 or 2, but still jams the lock on a 6. A Thief can use a successful picklock roll to clear a jammed lock. (Note that a 6 rolled on a clearing attempt makes the situation worse: each additional 6 doubles the number of successes required to clear the lock). At every three levels, a Thief gets an additional die to roll per attempt; a 1 or 2 rolled on any of them indicates a success, and a success on one die can be used to cancel out a jamming result (a 6) on another (a success used to cancel a jamming result doesn't count against the successes required to open the lock). Note that a successful picklock roll won't neccessarily open a lock; more difficult locks might require two, three or more successes to get them open. Particularly fiendish locks might even require multiple simultaneous successes, and would thus only be openable by Thieves of elevated rank. Or by a key. With a +1 weapon, instead of just adding +1 point of damage, the player would roll +1 damage die, and choose which of the two results to use. A +2 weapon would add two dice, and so forth. A character wielding a +2 longsword would get to roll 3d8 instead of 1d8, and could choose the result showing on any of them. A +1 dagger would roll 2d4 instead of 1d4, and so forth. Just to clear up any misconceptions: you DON'T add all the dice to get a damage result, you CHOOSE ONE of them. Falling characters take 1d6 damage per 10' per 10' fallen — i.e. 1d6 for the first 10', plus 2d6 for the second 10', plus 3d6 for the third, and so on — up to a maximum of 20d6 (terminal velocity). Falling (or fallen) characters are concussed for one Turn per point of damage over their level. They will be seeing double, will probably puke if they attempt any vigorous activity (or even no activity), and all their die rolls will be at minus 1 per Turn of concussion remaining. For example, a level 5 character who takes 10 points of falling damage will be concussed for 5 Turns, and will be at -5 to everything the first Turn, at -4 the second, -3 the next, and so on. A character who takes more falling damage than their level plus CON score is knocked out; the duration of unconsciousness is up to the DM, but when they wake up they will be concussed (as above) for at least a day. A character knocks off one die of damage for every point by which they make a saving throw. 1-6: Merely a flesh wound! Continue fighting with a -2 penalty on attacks and saves. 12-15: Crushing Blow! Character is stunned for 1d6 rounds, suffers a flesh wound, and must save versus petrification/paralysis or be rendered out of the fight � unconscious or otherwise crippled until healed. 16-18: Incapacitating Strike! Character is rendered unconscious or otherwise crippled and out of the fight until healed. Further, a saving throw versus death is required to prevent the obvious side effect of permanent and immediate death. 19: Deadly Blow! The character is dead. 20: Mangled! The character is dead, and body parts are missing, thrown around and otherwise mangled. 21+: Splatterfest! The character is not only dead, but is grossly dismembered and mangled beyond recognition. Arcane and Divine spells have been conflated into a single spell list of 20 levels. A magic-user may cast a single spell of their own level per day, and two spells of each lower level. For complete details of the magic system, go here. The Haste spell affects only a single target per casting. The existing spell description becomes that for Mass Haste, a non-standard 10th-level spell. Swords & Wizardry uses the old OD&D/AD&D standard whereby a gold piece weighs a tenth of a pound. This is one of the (many) things that raises hoots and squalls of outrage from the "realists" who insist that such coins would be the size of dinner plates. It's true that not many gold coins were minted in that sort of size, and it's also true that, compared with real-world usage, gold in the game is hugely undervalued (though that's a different issue entirely). However, the size of a 1/10lb (≅45 gram) gold coin isn't all that ludicrous, compared with real coinage. Gold is heavy. 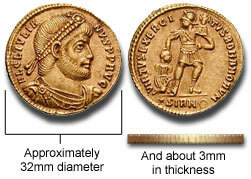 I've used a solidus from the reign of the Emperor Julian as a model. A OD&D gold piece would be about this size — about 32mm in diameter, and 3mm thick (on my own monitor, which is a 1440x960px display the image is about life-size; it may differ on your own monitor). As you can see, although the size of the coin is reasonably large, it's in no way beyond the realm of possibility. Of course, if you wanted to keep the "one coin = 1/10lb" rule for all coins then silver and copper coinage would be substantially larger... I haven't worked those sizes out just yet. I think they would be ludicrously huge. Farthings come in two forms: either a quarter cut from a silver penny, or as properly minted copper coins. If a modern-day comparison is desired, you can assume a farthing to be about the equivalent of a couple of dollars — however, there is unlikely to be an easy equivalence in the pricing of services or commodities, so such a comparison is of limited value. Coins are valued at 12 gold pennies or 240 silver pennies to one gold crown, and four copper or silver farthings to one silver penny — thus 960 farthings to the crown. Gold pennies are about 20mm in diameter and roughly 1mm thick. Silver pennies and copper farthings are roughly the same diameter as a gold crown, but considerably thinner (averaging a little over 1mm) and weigh in at 50 coins to the pound. There is another currency available — the mark — but it is seldom seen in day-to-day commerce. A mark is a plain silver or gold bar weighing one pound, stamped with a mint mark (hence its name). There are five silver marks to the crown, and ten crowns to the gold mark. Almost all money transactions are in copper or silver, not gold. Most shopkeepers would be more than happy to get their hands on a gold crown, but would be pushed to provide change for one. I've tended, in the past, to be a bit uncomfortable with the idea of equating treasure stolen earned with experience gained, but I've come around to it. Sort of. I'll go this far: characters can use gold in place of experience points on a one-for-one basis only when paying for training. Characters can use gold for xp only up to a maximum of 50% of the xp required to advance to the next level. For example, a 6th level Fighter requires 32,000 xp to advance from 6th to 7th level. He or she could spend up to 16,000 gp on training to offset that xp requirement, but no more (or at least, if more is charged by the trainer, the extra is wasted as far as experience value is concerned). My rationale for this is simple: people in our own world routinely pay vast sums of money to become "qualified" in a field, without any real-world experience whatsoever. Why should fantasy game characters not have the same opportunity? The only difference here is that the PCs have to get their on-the-job experience before they train, not afterwards. Plus, it gives the PCs something to do with their vast caches of swag. Training to advance in level will always cost a minimum of 10% of the level's experience requirement, regardless of any other considerations. This is additional to any gold spent to offset xp. Training time is dependent on the ratio of experience gained to gold spent. The base training time is one month, plus one week per 500gp used to offset xp requirements. To continue the example of the Fighter above, he or she would have to spend 1 month plus 32 weeks (16,000 ÷ 500) in training — a total of 9 months to complete training to 7th level. I've been mulling over a skill system for the game, with the hope of enabling players to customize and specialize their characters without having to resort to creating a mish-mash of new character classes. This much simpler system by bohemian (from the Swords & Wizardry forums) is actually better than mine, I think. I'd give players more at creation time and let them choose additional competencies or improve existing ones more often (say, every three levels) but otherwise I like it a lot. Here are some fairly clean, simple character sheets in PDF format. A6 index-card sized sheet — I guess the nearest US equivalent would be 6x4", and I've kept the margins adequate to print on either size. You can fit a surprising amount of information in a sheet this small. There's another version here which has four of them laid out on A4, which can be printed and trimmed to suit. A4 tent-fold (folds down to A5) — I'm fond of this format, because it's small enough to keep table-clutter to a minimum, and it can be used as a folder to keep the player's notes and what-not sorted out. Its main fault is that it has no specific place to write down a character's spells, but if need be they can be written on the obverse. Also, it only has room for five separate weapon types, so it may not suit those players who like to carry a golf-cart of different weapons. A4 double-sided full-sheet format — for those who like a bit more room to write stuff down. Again, there's nowhere specifically for spell lists, but there's a large area on the back labelled "Miscellaneous" which would fill the bill quite well.